This sermon is based off of Exodus 14:31 - 15:18. It is a song that the nation sings after God has drowned their enemies in the Red Sea. Go ahead and read that or the notes won't make much sense. I love what Joseph says here about the glory of God, and what that means. He says that everyone is hard-wired to have a main-thing in life, and I agree. It seems that we are predisposed towards following or worshiping something in life, no matter what. For me growing up (and maybe now too) it was bands and skateboarding. My sister obsessed over N' Sync and Harry Potter (teenage girls are really good at obsessing over things). My dad loves cars and motorsports. It's just a tendency in our lives to associate ourselves with something we identify with or feel passionate about. For many, those things come and go; replaced by new fads or more adult ventures. It's not always destructive to associate yourselves with these things in life, but I think everyone would agree that the total significance of skateboarding, Five Iron Frenzy or Ford Mustangs isn't much in the grand scheme of life. Further more, it all dies with us. Joseph says here that the most destructive thing a human can do is count on an inadequate god. I don't think I would ever admit that skateboarding was my god, but I sure devoted A LOT of time to it (and still do). Most people probably wouldn't admit that money is their god, or career or family or gardening...but maybe it is? 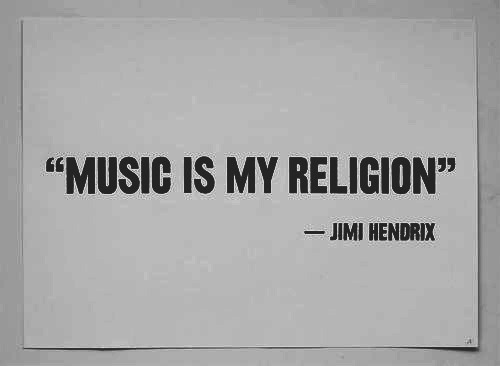 I've seen people with "Music is my Religion" stickers. I love music and attach a great deal of significance to its power to evoke emotion or describe a situation (after all, the bible verse for this sermon is a song). But is music an adequate god? If God really is who He says He is, and can defeat sin and death; and if there is no one like God, then nothing else deserves the seat of authority in our lives. That's a paraphrase from this sermon, but it's true, right? If the God of the bible is who He says He is, then putting our faith in our 401k, Jimi Hendrix or my ability to kickflip is futile. It's okay to enjoy those things, especially in light of God ("Every good and perfect gift is from above, coming down from the Father of the heavenly lights, who does not change like shifting shadows." - James 1:17), but pay attention to who or what carries the most weight in your life, or your path may be a rocky one. What fear has become your god? Why is it important that God tells the world who He is? Whether we like it or not, we are hard wired to follow a main thing. Something or someone is of ultimate glory, weight, significance in our lives. If God is at this place in our lives, he reorients everything else in our lives.